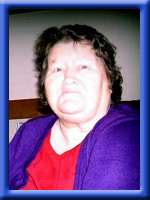 WEAVER – Loretta P., 74, of Milton Queens County passed away peacefully in North Queens Nursing Home, Caledonia on July 5th, 2011. Born in Liverpool, she was the daughter of the late Stewart and Margaret (Baker)(Conrad) Young. Loretta worked for the former Wong’s Restaurant in Liverpool as well as National Sea Products. She loved animals and enjoyed bingo. She will be fondly remembered as a fun loving, easy going person. She is survived by her sons David (Barbara) of Milton; Stephen of Liverpool and Shawn (Sara Everett) of Lower Sackville; brothers: Robert (Thelma) Young of Mersey Point and Roland of Ontario. 4 Grandchildren and 2 great-grandchildren. A number of nieces and nephews. She was predeceased by her husband Gordon, daughter Valerie Conrad, son Kevin and sister Faith. A private graveside service will be held Sunday, July 10th, 2011 in Milton Community Cemetery. Daivid, Stephen and Shawn and families we are sorry to hear about your mother passing away. Now she can be with your father and also not suffering anymore also. To the family of The Weavers, I would like to pass my condolences on to the family of Gordon and Lorretta Weaver.We will miss your parents as residents .I was on vacation when I heard the news.Lorretta was very quiet but so much fun.The unit will not be the same.Gordon was shy but a very nice man. Sarah the cat will miss Gordon for her treats. They will go to rest together.I wish she could have spent more time with each other at the home. Your hearts will be filled with sorrow but as a CCA we also loved them dearly.We will miss them. loss. Both of your parents were a pleasure to have as residents. Loretta’s laugh was contagious and Gordon was such a kind soul.I will miss them! We are thinking of you and your family at this very sad time. To lose them both so soon. But they are together and at peace. Takecare. please know we’re here if there is anything we can do. Sherman and I would like to offer our condolences on the losses of your mother and father. It is horrible enough to face the loss of one parent not two. Our sincerest sympathy. If there is anything at all we can do for you, please do not hesitate to ask. A shoulder, a hug, a drive, you name it. On behalf of the Palliative care team @N.Q.N.H. to the family of Gordon and Loretta.We will miss them. We are all sad to hear of your loss of both Gordon and Loretta.Our deepest sympathy to you all. Take care of each other. The Fox Family…Sandy, Carol, David and BettyJean. We are so very sorry to hear about your mom.You guys have had a lot to deal with lately.I guess you have to think that your mom wanted to be with your dad.They are no longer suffering and they are together forever.We both know how it feels to lose both of your parents(very empty feeling),cherish your memories as they will help you heal.Take care and know that we are thinking of you. So sorry to hear of Loretta’s passing. Our thoughts and prayers are with you all at this difficult time. Sorry to hear of Loretta”s passing. She will be missed. I am so sorry to hear about your Mom. Losing both parents so quickly must be very difficult. They were caring and generous individuals, and I have very fond memories of both of them. Now they are peaceful together. My thoughts are with you. My family sends their condolences as well. We are very sorry to hear about the loss of both of your parents. Our thoughts are with you all at this time.